Resveratrol makes some amazing claims. The box that my bottle came in says that delivers a pure concentration of Resveratrol to trigger your natural age-defying defenses and Longevity Genes. That really peaked my interest because I can honestly tell you that the last three years of my life has aged my face about ten years. Stress will do that to you. ResVitale the company that makes Resveratrol has harnessed the poser of the grape to provide protection for you. Using organic grapes and a patent pending Vine-to-Capsule extraction method enables the polyphenols to be preserved at their peak efficiency. This results in a better more pure product for you. Resveratrol is a powerful polyphenol found in the skin, seeds, stem and vine of red wine grapes that exert significant antioxidant properties. Thought to serve as one explanation for the French Paradox – the idea that the French have a remarkably low incidence of heart disease compared to Americans despite a diet rich in high-fat foods – Resveratrol has over 2,000 associated clinical studies documenting the amazing benefits. Harvard University biochemists believe that Resveratrol turns on the sirtuin gene, also known as the SIRT1 ‘longevity gene.’ By activating this gene, scientists believe Resveratrol mimics the effects of caloric restriction, which is thought to slow the aging process by limiting dietary energy intake. Resveratrol is also thought to slow many of the degenerative effects associated with aging and may potentially increase lifespan. Some of these health benefits may include protection from Alzheimer’s disease, Arthritis, cardiac disease and certain forms of cancer. Trans-Resveratrol, the bioactive form of the Resveratrol polyphenol, has been proven in clinical studies to activate SIRT1 and enhance cellular productivity. Trans-Resveratrol has also been shown to increase the number of mitochondria in cells, thus increasing energy capacity and enhancing sensorimotor function. I’ve been taking Resveratrol for two weeks. I wish I could say it’s turned back the clock 10 years but I don’t think anyone has developed that product yet. I have felt slightly more energy (without doing anything else different) and it’s helped some of the fatigue I feel in my legs walking up stairs. According to Harvard studies, Resveratrol has been shown to drastically improve endurance in test subjects. Researchers believe these results will continue to hold true in future studies. I don’t have Type 2 Diabetes but some of the biggest names in pharmaceuticals are betting on Resveratrol as the breakthrough treatment for Type II Diabetes. Testing has found that large dosages of Resveratrol actually countered the effects of Type II Diabetes. The results were so promising that the company was later purchased by one of the biggest names in the industry, GlaxoSmithKline. If you have a history of Alzheimer’s or Diabetes this is a product you should research for yourself and consider taking. If you have other questions you can check out their FAQ page. Make sure you check with your doctor first of course. 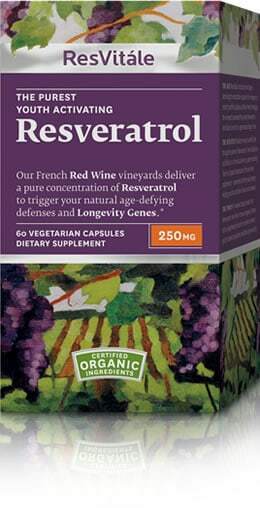 I was provided with a free bottle of Resveratrol for my review. This is my honest opinion and in no way influenced it. I was not obligated to provide a positive review. I would love to try all their products, but especially the ResVitále 250 mg. Thank you for the chance to win. I would like to try Beauty Sleep. I would love to try Beautiful Legs. I follow ResVitale on Twitter @RazzMyBerry. I follow on Networked Blogs – Breanne T.
Would like to try the Collagen Enhance 1000 mg.